It is steaming hot in Mumbai these days, in true October spirit, that goes without saying. As a result, my will to cook complicated dishes has all but melted like snow in the sun. 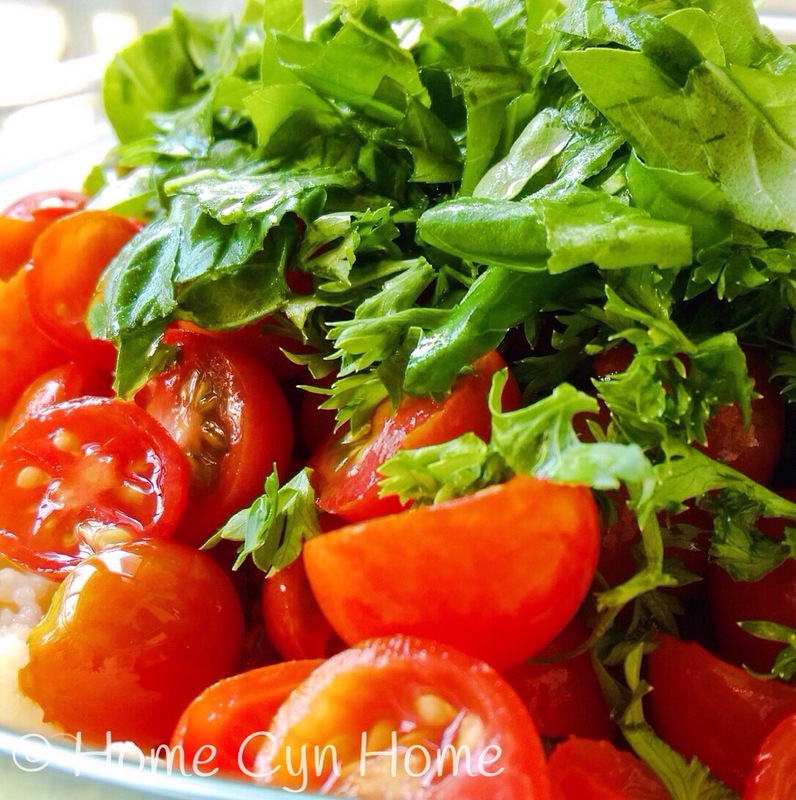 Salads are the perfect dishes to prepare and eat in this climate and this particular one is super easy and quick to pull. Couscous is originally the name of a Moroccan dish that is made of a semolina base and spicy meat and chickpea gravy. But, it isn't uncommon for the semolina itself to go by the name "Couscous" these days. In Europe, that type of salad would commonly be called a "Tabouleh" after the Middle Eastern dish of the same name. 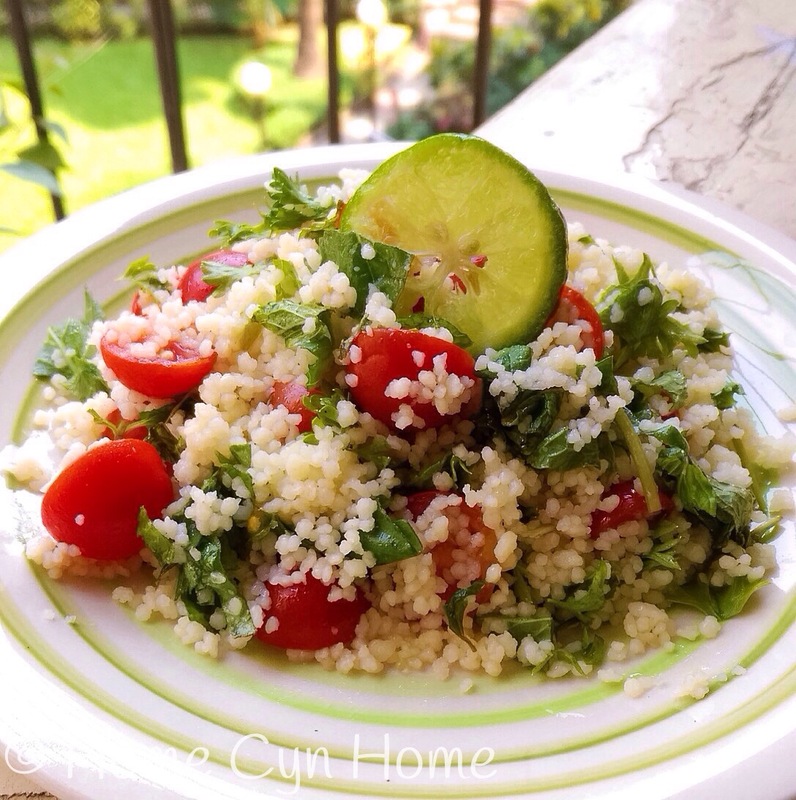 BUT a true Tabouleh is made with broken wheat, not couscous semolina, so I choose not to call my salad by that name. If you can't find couscous semolina where you live, broken wheat can be used just the same. While doing so, keep in mind the taste will be different and the prep time a bit longer (broken wheat requires a bit more soaking than couscous). The absolute beauty and advantage of couscous semolina is that it gets re-hydrated and cooked in minutes without much effort from your part. All you need to do is boil some water and pour it over the desired quantity of semolina and wait 5 minutes. If you are going to use it in a salad you will want to let it cool down too, but preparing it the night before and putting it in the fridge is not an issue. When I prepare this salad I use a very intuitive approach and do not really measure the ingredients that go in it, below, I'll give you an approximate, but you can easily adjust the recipe to your taste, what you have on hand and how many people you plan to feed. As an indication, the bowl above gave me 3 big servings. - 1 boiled water in sufficient quantity to cover the semolina properly. 1) Start by soaking your semolina. To do so, put it into a large salad bowl and pour boiling slated water over it until there is about a centimeter of water above the grains (a finger width or about a quarter of an inch if the metric system confuses you). It will take about 5 minutes for the grain to absorb all the water, once it has, use a fork to fluff up the grains and let it cool. 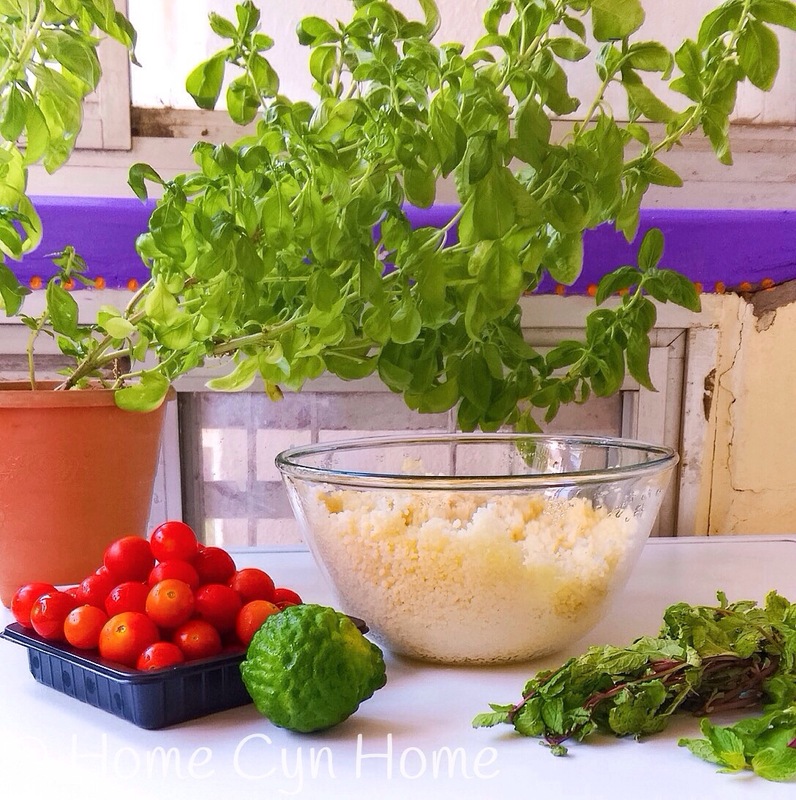 2) Halve your cherry tomatoes and mince your mint and basil leaves and add them to the cooled down semolina and mix well. 3) Add the olive oil, kafir lime juice and rice vinegar on top and mix again. Serve as it is or chilled, as a stand alone dish, or as a side to bigger meal. It definitely does, and it will spare your sanity in the kitchen too in this awful humidity. At the risk of of incurring your warth again, I ask you what is couscous semolina. Is it sooji or sabudana ?? and what exactly is broken wheat?? Couscous is semolina is sprinkled with water and rolled with the hands to form small pellets, sprinkled with dry flour to keep them separate, and then sieved & dried. Traditionally when prepared for consumption it was steamed. The couscous that is sold in most Western supermarkets has been pre-steamed and dried; the package directions usually instruct to add boiling water or stock and butter & cover tightly. Cracked wheat is crushed wheat grain that has not been parboiled. Bulgur is a cereal food made from the groats of several different wheat species, most often from durum wheat. Bulgur for human consumption is usually sold parboiled and dried, with only a very small amount of the bran partially removed. Bulgur is also known as "Dalia" in North India. Dalia is popular all over the wheat-consuming regions of North India. It can be consumed as sweet dalia or regular dalia. We still love you, Apple. No wrath has been incurred only a little bit of annoyance. is it? whew!!. The reason I asked it because navataras are starting next week and this could have been be a very wholesome nutritous food for those who fast during those days but now it turns out that it has grain in it. I wanted to recommend it to my friends who end up eating something heavy during fasting and complain. navataras food is more heavy than the usual food because people go to extreme ends to find food that is not grain based. The result is some fried unheathy stuff. This is not a suggestion but what came to my mind. I don't want anything to change in the dish. no never. It is very good as it is. I rest my case my lord. I'm not fond of couscous . I prefer 'tabouleh' made with bulgur, tomatoes, parsley, mint, finely chopped onion & seasoned with olive oil, & lemon juice. Sometimes I put in black olives or crumble some feta cheese in if I can find them (typical Arab/ Mediterranean ingredients). The bulgur is more 'whole meal) & has more fiber than the semolina based couscous- better for my 'low carb' diet. Couscous is almost like a little noodle to me. I like bulgur wheat too, but it takes a bit longer to fix, but it is definitely more of a whole meal and low GI food than couscous. I love the actual couscous dish with all its meaty gravy goodness, but that will have to wait for the temperatures to cool down a little. Apple, this is definitely not a food for those who fast as it is a grain based food, but definitely a hot weather dish for those who don't fast. It also make for a great lunch tiffin for kids to take to school as it covers all food groups ( adding chunk of paneer or feta cheese to make it more protein rich). And no no we don't hate you. Those who fast during the navataras can just toss the tomatoes and leaves together and do the same dressing and add nuts or paneer to it (though I don't remember if those are allowed during the fast). Happy Navaratras to you and family. May Goddess Durga bless you with strength, prosperity and more creativity. Looking forward to Durga Pooja celebrations starting next week. It will be fun to travel in own car this year. This week Ishita has an emergency holiday in school due to some electrical repair, so she is home the whole day unable to play with friends because they are all in other schools. DH is away on a business trip, so needless to say that my entire planning for the week ahead has been thrown out of whack. Navratri isn't the object of a big holiday in schools in Mumbai, they had 5 days for Ganesh Chaturthi and a whole 3 weeks for Diwali. So this week being off is really not a good thing.